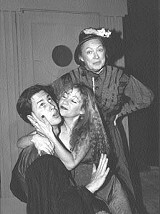 Acting Silly: Terra Shelman caresses Cameron McVeigh while Betty Cole-Graham smiles for the camera. THE HOLIDAY SEASON induces dread in theater people for more reasons than the usual drear chill of shopping on (bad) credit and the prospect of spending quality time in hot, closed rooms with those well-intended types who ruined their childhoods. Because for theater people, the holidays mean but one thing: another production of Charles Dickens' ghost of Christmas perpetual, A Christmas Carol. Inspecting Carol, sure to cause much hilarity at Sebastopol's Main Street Theatre through Dec. 21, draws us into the antics of one such group, a failing theatrical troupe preparing for their 13th production of this Cratchity chestnut. And 13 is such a lucky number. Placed in the present--ostensibly at Main Street Theatre itself--the gang is led by Zorah (the assured Terra Shelman), a feisty Lithuanian beauty running the company alone after her husband hanged himself as the result of a bad review. The troupe is flat broke and on the cusp of losing its National Endowment for the Arts grant--even though the politically conscious Zorah has hired the African-American Walter (Jonathan Taylor--who, we hope, was suffering only from opening-night jitters and will soon know his lines fluently) to play the ghosts. Dumbing down their repertoire for years to please subscribers (even going so far as taking all the "fucks'" out of Glengarry Glenn Ross, resulting in a whistle-clean five-minute performance), the troupe is further racked by the NEA's grant-bound request that it offer quality as well as familiarity. An NEA inspector is due to arrive and review the group's efforts, and when the hapless Wayne (in a wavering performance by Cameron McVeigh) wanders into the theater looking to audition, Zorah and stage manager Kevin (Ken Griffin) judge this sad sack so unlikely to be a budding thespian that they decide he must be the inspector. Groveling in several delicious ways to please him, the troupe ends up putting on a dress-rehearsal performance of A Christmas Carol so disastrous that it could have been imagined only by veteran stagehands. So spins 'round this devilish comedy, written by playwright Daniel Sullivan four years ago during his tenure with the Seattle Repertory Theatre. Fresh and modern, poking fun at most every politically correct conceit of the '90s, Inspecting Carol is nonetheless built upon the sturdy chassis of classic farce, setting up first-act situations that play themselves out with a pleasing predictability. Directed by Peter Nyberg (whose efforts for the Pacific Alliance Stage Company at the Spreckels Performing Arts Center have included such cerebral hits as Oleanna, The Benefactors, Painting Churches, and A Walk in the Woods), Inspecting Carol is a tightly choreographed ensemble piece with hit-and-miss performances just a click away from being outstanding. Among the hits is Grey Wolf's performance as Larry. The troupe's radical, he once performed Scrooge's role entirely in Spanish as a protest against U.S. involvement in Central America. Wolf is actorly and energetic and completely absorbed in his role, as, in theirs, are Betty Cole-Graham as the aging Dorothy, her doting nephew Sidney (Matt Farnsworth), and the businesslike stage manager M. J. (Peggy Van Patten). Phil (Alan Kaplan, an aggrandizing hoot in a backwards back brace), suffers under the weight of the growing Luther (Derek Fischer), whose Tiny Tim still rides piggyback, though he ain't so tiny anymore. The slight imperfections of performance (McVeigh and Taylor fall just enough below company standards to be noticeable) don't keep Inspecting Carol from being a refreshing holiday offering--cynical and wise, and sure to induce belly laughs at the end. Inspecting Carol runs Thursdays-Saturdays through Dec. 21 at 8 p.m., with Sunday performances Nov. 17 at 2 p.m. and Dec. 1, 8, and 15 at 7 p.m. No show Nov. 28. 104 N. Main St., Sebastopol. Tickets are $12. 823-0177.